During Analysis of the CAPTCHA integration libraries provided by several CAPTCHA providers (including reCAPTCHA) revealed that almost all of the CAPTCHA verification API’s relied on plain text HTTP protocol to perform CAPTCHA validation. Because of this, the CAPTCHA provider’s identity was not validated, message authentication checks were not performed and the entire CAPTCHA validation was performed on an unencrypted channel. This vulnerability was also reported to reCAPTCHA team several months back. In the current scenario, two types of attacks can be launched against vulnerable CAPTCHA implementations. These attacks are based on the assumption that an attacker is able to intercept the CAPTCHA validation traffic between target website and the CAPTCHA provider. Use the CAPTCHA service for without registering for the service by using the captured keys. Exhaust the target web site’s CAPTCHA quota for the service, which depending on the CAPTCHA provider may cause a wide variety of unexpected issues. The following image describes what I call the "CAPTCHA Clipping Attack". Notice that steps 5 and 6 in blue would be the normal operation of events. We'll go into the attack in a little more detail below. 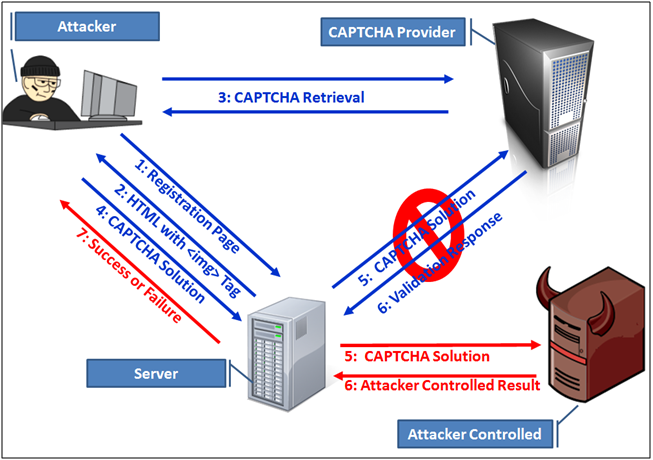 Since the website’s application server acts as a client to CAPTCHA provider during steps 5 and 6 (in blue) and the application server often neglects to validate the CAPTCHA provider’s identity and the session integrity checks, an attacker may be able to impersonate the CAPTCHA provider and undermine the anti-automation protection (steps 5 and 6 in red). CAPTCHA validation responses are mostly Boolean (true or false, success or failure, pass or fail, 0 or 1). The response format and its contents are also publicly available as part of CAPTCHA provider’s API documentation. This allows an attacker to easily construct the finite set of possible responses, impersonate the CAPTCHA provider, and perform malicious CAPTCHA validation for the application servers. The attacker acts as a legitimate application user and submits a large number of requests to the web application. At the same time, he/she intercepts CAPTCHA validation requests, masquerades as the CAPTCHA provider and approves all submitted requests. Masquerading as the CAPTCHA provider and not forwarding the CAPTCHA validation requests to the actual CAPTCHA provider is the CAPTCHA Clipping Attack. Performs signature based CAPTCHA provider detection and clipping. Can be easily extended to masquerade as any CAPTCHA provider by adding corresponding signatures to the configuration XML file. Logs POST requests that match any supported CAPTCHA provider to capture private and public keys. Unmatched requests are forwarded as is. clipcaptcha supports five operational modes. These are “monitor”, “stealth”, “avalanche”, “denial of service” and “random”. Want more info? We'll have a new whitepaper about the attack in Foundstone's whitepaper section soon! Well I really admire developer who develops program tocaptcha bypass, So I can see clearly the images. Well I know that website owners uses capthcha to protect their sites from spammers. However some capthcha generator are very distorted.